A demonstration system consisting of a Karlville slitter-rewinder and LaserSharp® laser processing system will be installed within Karlville’s new facility in Miami, FL in December 2015. FlexPak-Miami will deliver laser contract manufacturing services and laser equipment sales to satisfy the increased demand for laser perforating and scoring for flexible packaging in the region. The demonstration system will be available for confidential package design and testing, prototyping, laser contract manufacturing, and equipment demonstrations to offer customers multiple flexible packaging solutions using LaserSharp technology. 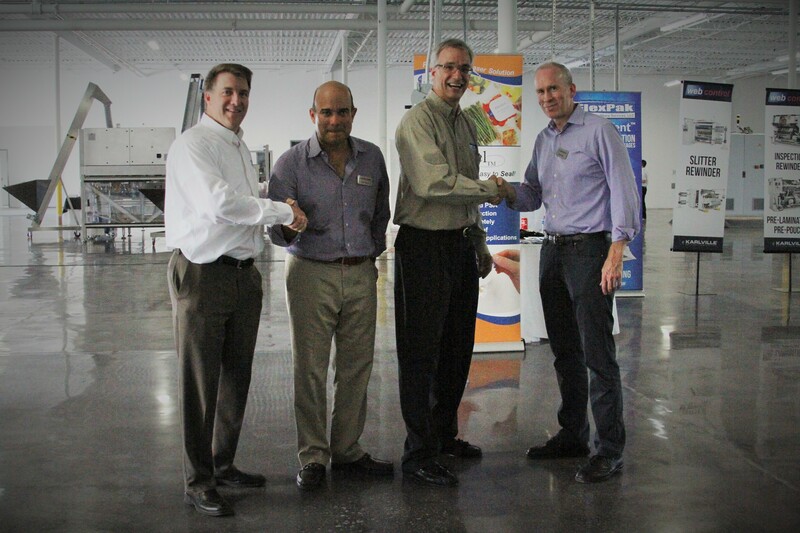 LaserSharp® Equipment LaserSharp FlexPak Services, LLC, will partner with Karlville Development, LLC to launch joint efforts in selling laser based systems for flexible packaging manufacturers in the Southeast USA, Caribbean, and South America. LaserSharp® technology is able perform high-speed laser micro-perforations, precision scoring, cutting, and marking. Demonstration systems located in Karlville’s Miami facility will integrate LaserSharp technology in Karlville’s slitter-rewinder and pouch machines. Breathable Packaging LaserSharp® perforating offers precise micro- to macro-perforations, enabling breathable features for vapor and gas exchange through precision hole size, depth and location. LaserSharp perforating is ideal for perishable food, microwaveable products, and rapid fill packaging. Easy Open LaserSharp® scoring enables easy open packages by laser scoring any pattern in registration with the printed film at precise depths without compromising the film’s barrier properties. LaserSharp® scoring also offers a variety of processing capabilities including security and identification marking, machine direction, cross-web and contoured laser scoring at web speeds greater than 300MPM (1000FPM). PrimeVent™ Microwaveable Packaging – New Product LaserSharp FlexPak Services is proud to launch PrimeVent, a new hermetically sealed solution for microwavable packaging. PrimeVent™ guarantees a hermetically sealed package prior to cooking and a reliable and safe steam release when microwaved. PrimeVent offers self-venting features in most flexible packaging materials; enhancing the quality of the microwaved product and improving consumer convenience. PrimePeel® Resealable Packaging PrimePeel is an innovative resealable package design for use in any lidded tray or pouch. PrimePeel™ technology enables packages to be easily opened and reclosed, while maintaining the integrity of its contents. PrimePeel™ is often used to preserve perishable food items such as produce, cheese, and cookies, and other consumer products like cleaning wipes. Slitting Karlville’s SLIT family of slitter-rewinders offers a wide range of models from simple entry level to top level performance models with high tech features. The Model UHS-II used in the demonstration system offers a high degree of versatility for the best performance for even the most difficult materials. Optional automatic features, i.e. knife positioning, finished roll unloading, increases productivity and provides quality assurance. Performance specifications include web speed of 700 m/min, web widths in 1350 / 1600 / 1800 mm, and rewind diameters in 600 / 800 mm. LaserSharp FlexPak Services, LLC specializes in contract laser converting services for the flexible packaging industry. Located in St. Paul, Minnesota, LaserSharp FlexPak Services is dedicated to developing innovative laser solutions for flexible packaging. Karlville Development Group, LLC is a leading global machinery manufacturer for the converting and packaging industries. Karlville has a global influence with service and manufacturing operations in the Americas, Europe and Asia. Headquartered in Miami, Florida, machinery is sold under the Karlville brand, Beyond Converting.